How often do we write letters anymore? When was the last time I sat down, with a pen and paper (or, fine, a laptop)? It’s not something we do often. Email is today’s form of a letter but we use it for business, for necessary communication. Letter writing feels like something altogether different. Letter writing is reserved for when we have something meaningful and personal to say. The last time I wrote a letter, not to be confused with a thank you note, I was saying something deeply personal to someone very close. The Apostle Paul wrote letters to many, different faith communities in his ministry. Some of the communities were having theological arguments that he needed to help sort out. Others were concerned about him sitting in prison and he wrote to ease their worry. Some of Paul’s letters were in response to good reports about how the community was doing. But, in all of his letters there are two consistent characteristics. He reminds each community of the centrality of Christ’s teaching and he encourages them. As I was thinking of how to write you, I could think of no better model. I have loved my time at Plymouth. I have grown to love many of you. I love our worship together. I love our ministers and staff. I’ll return to Georgia a better minister because of my time here. So, while it will be difficult for me not to be with you, I am not worried because of who I see you to be, Plymouth. You are a church that indeed encourages one another and looks to the Gospel for hope, instruction, and purpose. The centrality of Christ in all aspects of your ministries is evident. Paul wrote to the Thessalonians in his first letter of the beautiful hope we have in Christ. Life was not always easy for this community living in Greek culture and learning to follow the way of Jesus. Culture often conflicts with what we learned from God incarnate. And so Paul, to these people he had grown to love, wrote these words: “Therefore encourage one another and build each other up, just as in fact you are doing.” That is what I, likewise, say to you. Thank you for blessing my life richly and for encouraging me. Keep up the good work of God that I have seen you doing and keep remembering because of whom you do it. Be different and have courage for the awesome work that God is offering you. See with God’s eyes and know that the spirit of love shines brightly through you. I pray all of God’s grace and joy for you as you continue to grow in community and faith. After Jesus’ first sermon, the congregation tried to throw him off a cliff. 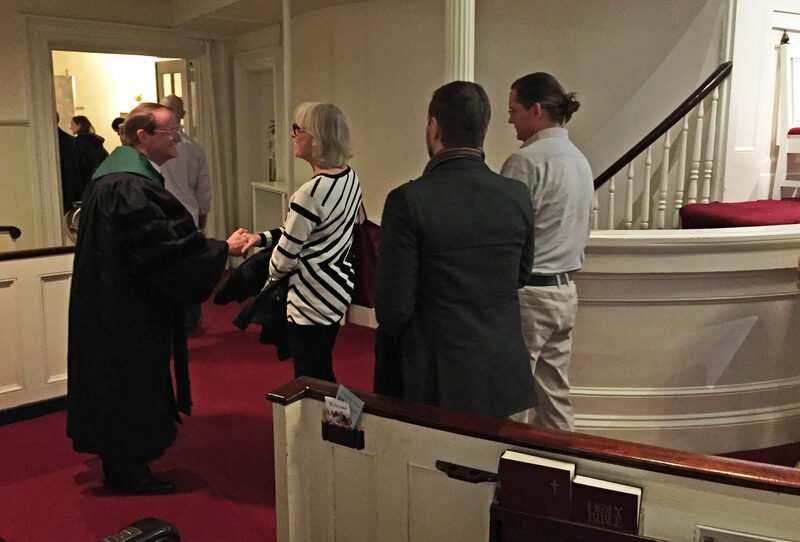 Since then churches have instituted a receiving line as a way to avoid an unfortunate end to a worship service. 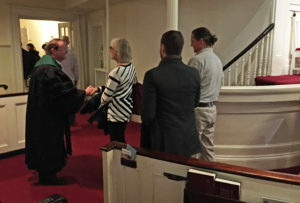 The preacher at Plymouth is stationed at the door through which most people exit, but we leave room for the disgruntled to escape without comment. I rely on my phone a bit too much. It’s my personal assistant, reminding me of appointments I’m prone to forget and birthdays I don’t want to miss. My phone gives me access to the latest news and weather updates- however unpleasant at times. It lifts my spirits. Songs I waited hours to hear on the radio, photos of my family and favorite spots in Brooklyn are a thumb tap or two away. My phone makes communicating easy and efficient. I can text everything. Information- on my way- have entire conversations. I can check my work email and gmail and share a moment with friends via Instagram. Occasionally I’ll even talk to someone, the old fashioned way; but I refuse to face time. A child whose family had moved came to visit his former Sunday School class a few weeks ago. Every other boy focused on retaining his popularity in the classroom. Bad jokes were made and the laughter was louder than usual. Goldfish crackers and Lego pieces were “accidentally” thrown. I started the lesson about temptation with a question: “What are you sometimes tempted to do even though you know you shouldn’t?” Not an easy answer to share but a number of hands went up. A number of children were willing to reveal themselves, to take a risk, to trust that their audience would be kind. The first child cautiously admitted that she wanted to be a couch potato, to watch movies and read all day long. A clever, honest answer. Well, some of the boys thought that was just too funny. As their laughter took over the room, the child’s tears took over her face. But they weren’t looking at her face, they were looking at each other for approval. When they did look at her face, when they saw her trembling lips and eyes, they were horrified. Their intentions had not been bad, but the outcome was. While I will never agree to face time on my phone, I will remember to do face time in life.